I was admitted to the Presidio Surgery Center for a Birmingham Hip Resurfacing procedure performed by Dr. Peter Callander in May/2017. My experience went far beyond my expectations. Dr. Callander is quite simply an exceptional surgeon whose humility is rare for such an accomplished physician and it is always on display in his bedside manner. He and his team go to great lengths to infuse confidence and a sense of ease to prepare you for the procedure. The results are amazing. I do not possess the vocabulary to express how thankful I am that I crossed the path of Dr. Callander. The dude is a superstar and I cannot fathom turning my physiology over to anyone else for a hip or knee procedure. My experience at the Presidio Surgery Center was equally amazing. I’ve had five different surgical procedures, and my procedure at PSC was in a league of its own. Admitting was streamlined and pre-op was comforting. For a hip procedure, I was admitted for an overnight stay. To my amazement, I was the only overnight patient in the center, and I learned that there are never more than two patients admitted at a time for overnight stays. I was treated like royalty. I had three attending nurses who were caring, attentive, and professional. They love their work and it showed. I believe they grew tired of how often I expressed my gratitude and amazement as to how well I was treated and how remarkable the center is ran. It is an ultra-clean, well-organized, no-stress atmosphere which is vital to recovery. In the morning I was visited by Dr. Callander, his awesome P.A. Johnna Walker, and very knowledgeable P.T. Sean. They saw to it that I was informed and very well prepared for the ensuing recovery period. I was given options by Dr. Callander as to where I wanted my procedure performed; I am relieved and fortunate that I chose the Presidio Surgery Center. 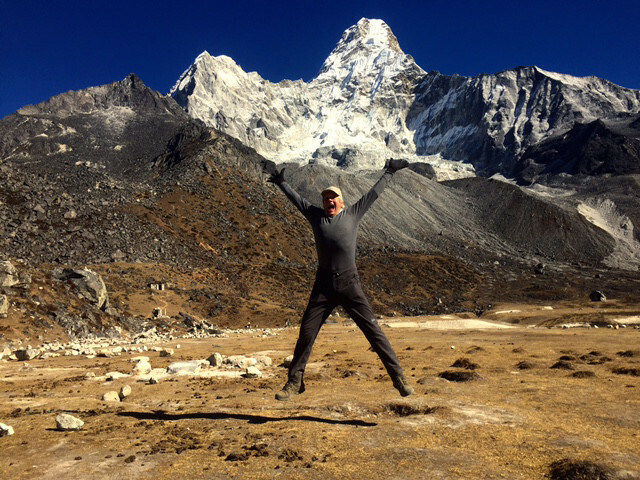 Dr. Mayle: Here is a picture of me at the Ama Dablam Basecamp a couple of weeks ago. The picture was taken at about 16,000 feet in elevation and a few miles from Mt Everest and Lohtse. This was about seven months after you and your team did a total knee replacement on my right knee. The new joint was working great on this two week trek. We have also done some significant hiking in Japan and China. Thanks to you and your team for helping me have the adventure of a lifetime. I will send more pictures from the Andes in September.